Papaya belongs to a small family of only 4 genera and 27-30 species, the Caricaceae (some estimate up to 71 species). Active breeding programs in a number of countries have produced cultivars that match local preferences for fruit size, shape, flesh color, flavor, and other characteristics. ‘Hortus Gold’ and ‘Honey Gold’ are gold-yellow skinned, yellow fleshed cultivars popular in South Africa; they are twice the size of ‘Solo’ types grown in Hawaii, but smaller than most papaya grown in tropical America. Cultivars grown in Central America are larger, often cylindrical in shape, such as ‘Cartagena’, ‘Cedro’, and ‘Santa Cruz Giant’. 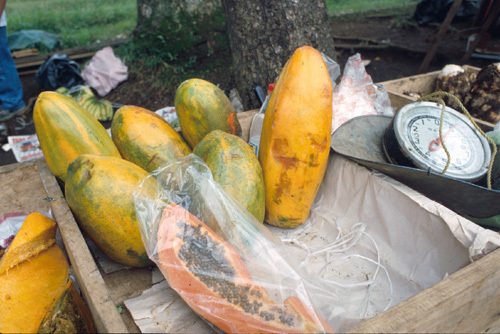 The transgenic cultivars ‘Sunup’ (red flesh) and ‘Rainbow’ (yellow flesh) have resistance to papaya ringspot virus, and were derived from ‘Solo’ parent lines. 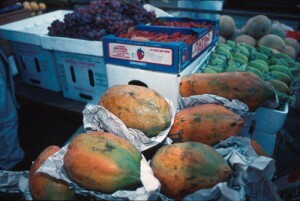 Papaya is native to tropical America, from Southern Mexico through the Andes of South America. It was spread to the south by Indians, and throughout the Caribbean with Spanish exploration. The Spanish also carried it to Europe and the Pacific Islands. By the mid 17th century, papaya was distributed pantropically. Papaya was introduced to Hawaii in the 1800s, and Hawaii remains the only state in the USA to produce papaya commercially. A small industry developed in Florida in the first part of the 20th century, but declined rapidly with the introduction of viral diseases that today threaten papaya elsewhere. 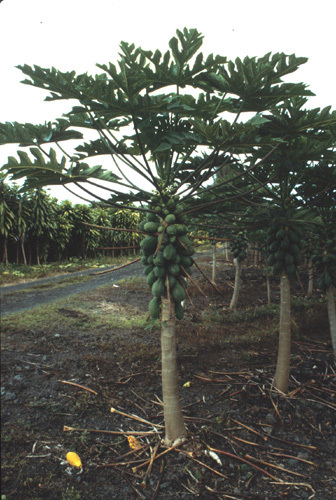 In fact, the recent decline of the Hawaiian industry was caused primarily by the same pathogen that destroyed plants in Florida – papaya ringspot virus. However, the disease was overcome by biotechnologists at the University of Hawaii, who inserted a gene into the ‘Sunrise’ cultivar that conferred resistance to the virus. This made the papaya the first genetically modified fruit crop used for human consumption. Since 1998, most of the papaya acreage in Hawaii has been changed to genetically modified cultivars. World (2004 FAO) – 6,504,369 MT or 14 billion pounds. Produced in 54 countries worldwide, on about 900,000 acres. United States (2004 USDA) – 16,136 MT or 35.5 million pounds. Production only in Hawaii, on about 1400 acres. Yield is twice the world average at 28,000 lbs/acre. Growers receive 20 to 60 ¢/lb, and the entire Hawaiin industry is valued at just $12 million. A large, single-stemmed herbaceous perennial, to 30 ft, <20 ft in cultivation. Leaves are very large (up to 2 ½ ft wide), palmately lobed or deeply inscised, with entire margins, and petioles of 1-3.5 ft in length. Stems appear as a trunk, are hollow, light green to tan brown, up to 8″ in diameter, and bear prominent leaf scars. 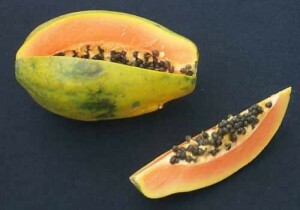 Female flowers of papaya are pear shaped when unopened, and distinguished from bisexual flowers which are cylindrical. Plants are dioecious or hermaphroditic, with cultivars producing only female or bisexual (hermaphroditic) flowers preferred in cultivation. Papayas are sometimes said to be “trioecious” meaning that separate plants bear either male, female, or bisexual flowers. 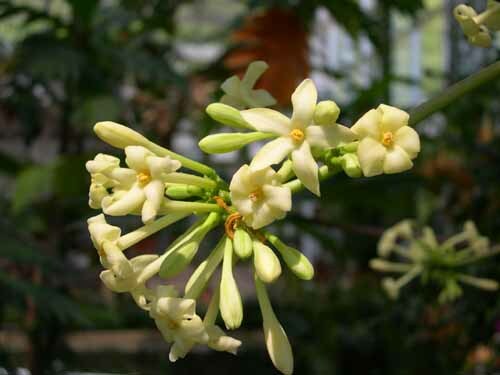 Female and bisexual flowers are waxy, ivory white, and borne on short peduncles in leaf axils along the main stem. Flowers are solitary or small cymes of 3 individuals. Ovary position is superior. Prior to opening, bisexual flowers are tubular and female flowers are pear shaped. Since bisexual plants produce the most desirable fruit and are self-pollinating, they are preferred over female or male plants. A male papaya is distinguished by the smaller flowers borne on long stalks. 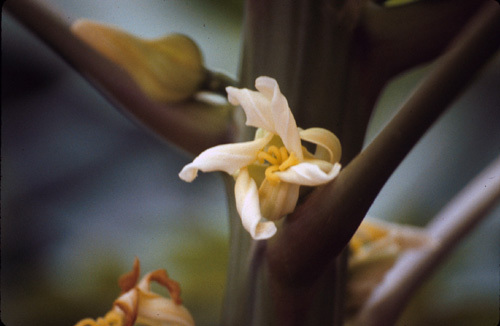 A male papaya is distinguished by the smaller flowers borne on long stalks (left). Female flowers of papaya (right) are pear shaped when unopened, and distinguished from bisexual flowers which are cylindrical. Bisexual flowered plants are self-pollinating, but female plants must be cross pollinated by either bisexual or male plants. Large, oval to round berries; sometimes called pepo-like berries since they resemble melons by having a central seed cavity. Fruit are borne axillary on the main stem, usually singly but sometimes in small clusters. Fruits weigh from 0.5 up to 20 lbs, and are green until ripe, turning yellow or red-orange. Flesh is yellow-orange to salmon at maturity, the edible portion surrounding the large, central seed cavity in the center. Individual fruits mature in 5-9 months, depending on cultivar and temperature. Plants begin bearing in 6-12 months. Planting Design – rows about 6 to 8 ft apart, yielding plant densities of 600-1200 plants/acre. Training – no training required and little or no pruning. Papayas are harvested when the first hint of yellow coloration appears. Fruits are hand harvested carefully to avoid scratching the skin, which would release latex and stain the skin. To reduce post-harvest fruit rot, papayas are commonly heat treated postharvest (110-120°F), then rinsed in cool water. Fungicides also may be used, generally in the wax applied during packing. Radiation treatments such as “Sure Beam” are used to sterilize fruit fly eggs and larva in fruit intended for export. Fruit are packed into single-layer boxes (10-15 lbs), often with tissue or foam padding to avoid bruising. Fruits can be cured at 85F and 100% humidity for better color expression prior to shipping. Below 50°F, papayas experience chilling injury. Papayas are extremely perishable; shelf life at room temperature ranges from 3 to 8 days, depending on storage atmosphere. Papaya grown in Hawaii is utilized largely for fresh market (93%), with small amounts processed into juices and other processed foods. Young leaves can be cooked and eaten as a green vegetable. Green or unripe papaya is used as a vegetable or salad garnish as well, but must be boiled first to denature the papain in the latex. Per capita consumption of papaya is 0.9 lb/year.